Because there are potentially so many different causes of lameness, it is important to have your dog seen by the vet. The cause of the lameness will affect the type and length of treatment as well as the prognosis. A thorough history and clinical examination is always a good starting point and after this further diagnostic tests may be required. Let’s look at it in more detail. Arthritis in dogs is an extensive syndrome with many different causes. Canine arthritis may also be referred to as osteoarthritis or degenerative joint disease and is characterised by pain and inflammation in one or more joints. Arthritis occurs when the protective layer of cartilage at the ends of bones becomes damaged and exposes the bone underneath to wear and tear. Arthritic dogs may walk stiffly, limp on certain legs and show stiffness or discomfort when getting up. They may be lame on a certain limb and some joints may be swollen or painful. They may be less flexible in their joints and struggle to jump, run or use stairs. The vet will diagnose arthritis on the basis of a physical exam, history of the dog and diagnostics tests such as X-rays. Arthritis can be the result of injury to a joint, infection within the joint, an inherited or developmental condition such as elbow or hip dysplasia, or immune system problems. Obesity contributes to arthritis as there is extra stress and strain on the joints. If a dog fractures bones that involves the joints or injury to ligaments, tendons or muscle, this can also lead to arthritis later on. Large and giant breed dogs are more susceptible to developing arthritis but any breed and size of dog can suffer from it. This is because there are so many different causes of arthritis. Regular exercise and good quality food may help prevent or at least help slow the progression of arthritis. It is important for large and giant breed dogs to be placed on a suitable food and monitor the amount whilst they are still young and growing. Arthritis cannot always be predicted or prevented but it can be managed and the progression slowed. Short, controlled periods of low impact exercise, such as swimming and short leash walks. Physiotherapy and hydrotherapy may be useful to strengthen the muscles and improve the range of motion of joints. Raising water and food bowls will help avoid stress and strain on the neck and back. A joint diet or joint supplement may help maintain weight and joint health. Anti-inflammatories and pain medication may be needed in severe cases. Cancer is a class of disease in which cells grow rapidly and uncontrollably. It can affect one part of the body or spread throughout the body. As cells age, they are more prone to becoming abnormal and cancerous. There are a multitude of cancers in dogs, some which grow very rapidly and others, which grow slowly. Osteosarcoma is the most common form of bone cancer in dogs. It can grow very fast, is very aggressive and is often extremely painful. It most commonly affects the long bones but can grow anywhere. It does often spread to the rest of the body, commonly the lungs. Unfortunately the prognosis is very poor but chemotherapy as well as limb amputation may be an option in early cases. Sometimes the bone affected by cancer becomes so weak that it may actually break. Osteosarcomas are most commonly diagnosed on X-rays as it has a very distinct appearance, but further diagnostic procedures may be required. Other types of bone cancers may also cause lameness but may not be as fast growing or aggressive. Often tests like a bone biopsy, where a piece of the bone is taken out with a special instrument under general anaesthesia, is required to confirm a diagnosis. Cancers like lymphoma may also cause lameness. This is due to the fact that the lymph nodes, which are much larger than normal and not functioning properly, do not drain away the lymph and blood. The limb may become swollen and painful. The treatment for cancer depends on the type as well as how far it has spread. Chemotherapy may be an option and the vet will most likely refer your dog to a specialist vet for this. In terminal cases, pain management becomes very important but eventually your pet will succumb to the disease. 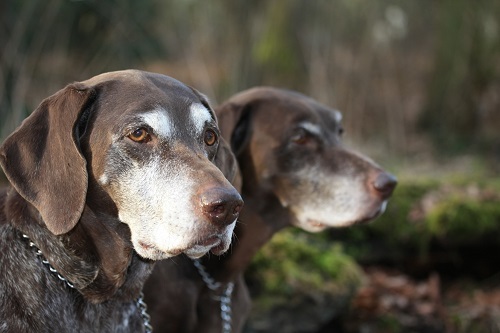 As a dog gets older, they do become less active and so trauma is less likely. However, as with older people injuries still occurand more so in the very late stages of life. An older dog may still rupture a ligament such as the cruciate which helps keep the knee stable, or break a bone after being hit by a car. Infections in the joints may also occur due to a long standing wound or infections that have spread. A thorough history and clinical exam will help the vet determine a likely cause as well as what further tests to do. There are many different causes of lameness in older dogs. Arthritis is probably the most common cause but there are many other conditions. If your older dog is limping or appears painful for anything longer than a day or two, it is important to get the veterinarian to have a look at him or her. If a definitive diagnosis cannot be made immediately, further testing will most likely be required. Fortunately with the advent of specially formulated diets and supplements, the onset of arthritis can be postponed quite significantly and if and when it does occur, both therapeutic diets as well as advanced anti-inflammatory medicines, can ensure extended and pain free quality of life.